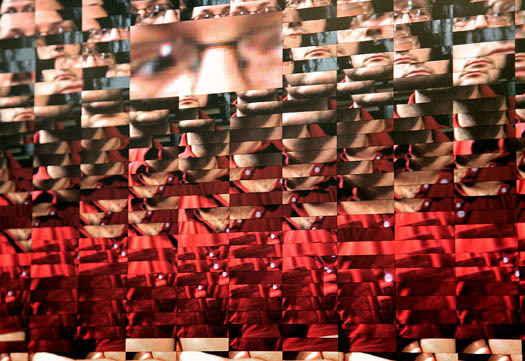 Rafael Lozano-Hemmer was born in Mexico City in 1967. In 1989 he received a B.Sc. in Physical Chemistry from Concordia University in Montréal, Canada. Electronic artist, develops interactive installations that are at the intersection of architecture and performance art. His main interest is in creating platforms for public participation, by perverting technologies such as robotics, computerized surveillance or telematic networks. Inspired by phantasmagoria, carnival and animatronics, his light and shadow works are antimonuments for alien agency. His work has been commissioned for events such as the Millennium Celebrations in Mexico City (1999), the Cultural Capital of Europe in Rotterdam (2001), the UN World Summit of Cities in Lyon (2003), the opening of the YCAM Center in Japan (2003), the Expansion of the European Union in Dublin (2004), the memorial for the Tlatelolco Student Massacre in Mexico City (2008), the 50th Anniversary of the Guggenheim Museum in New York (2009) and the Winter Olympics in Vancouver (2010). His kinetic sculptures, responsive environments, video installations and photographs have been shown in museums in four dozen countries. In 2007 he was the first artist to officially represent Mexico at the Venice Biennale with a solo exhibition at Palazzo Soranzo Van Axel. He has also shown at Art Biennials in Sydney, Liverpool, Shanghai, Istanbul, Seville, Seoul, Havana and New Orleans. His work is in private and public collections such as the Museum of Modern Art in New York, the Jumex collection in Mexico, the Museum of 21st Century Art in Kanazawa, the Daros Foundation in Zürich and TATE in London. He has received two BAFTA British Academy Awards for Interactive Art in London, a Golden Nica at the Prix Ars Electronica in Austria, a distinction at the SFMOMA Webby Awards in San Francisco, "Artist of the year" Rave Award in Wired Magazine, a Rockefeller fellowship, the Trophée des Lumières in Lyon and an International Bauhaus Award in Dessau. He has given many workshops and conferences, among them at Goldsmiths college, the Bartlett school, Princeton, Harvard, UC Berkeley, Cooper Union, MIT MediaLab, Guggenheim Museum, LA MOCA, Netherlands Architecture Institute and the Art Institute of Chicago. His writing has been published in Kunstforum (Germany), Leonardo (USA), Performance Research (UK), Telepolis (Germany), Movimiento Actual (Mexico), Archis (Netherlands), Aztlán (USA) and other art and media publications.